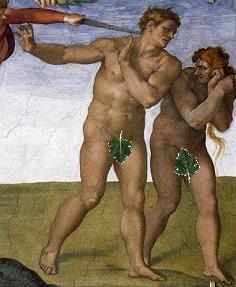 most of the naked “art” I remember growing up involved delicately placed fig leaves. My home town of Palos Verdes Estates even had a statue of a naked King Neptune standing in the middle of Malaga Cove Plaza, who, by the time I was old enough to snigger about it, also had a fig leaf discreetly attached to his front. That and the horribly abused fig tree at the bottom of the bank that spilled off our lawn is all I can remember of figs from back then. I certainly don’t remember eating them. My wife on the other hand is a huge fan of figs. As far as I know, this passion only began in San Francisco when a cooking school friend brought a fig, goat cheese and arugula salad to brunch. The salad had a terrific combination of flavors that, together with a nice group of people, good wine, conversation and perfect rooftop summer weather, made a lasting impression in my wife’s mind. That salad was from the early days of our relationship. Well before we were married, but after the long, slow courtship via US mail and the telephone. We had both moved to San Francisco as a neutral city (I’m from LA, she’s from Chicago), and were still trying to learn how to live in the same place. Some of our best, most intimate experiences from those times were built around food and wine. My wife’s other favorite salad is the Caprese, which we first made with little pear and cherry tomatoes we got on a trip to the ferry building farmer’s market. It was there that we first got into the habit of making food for Christmas gifts, starting with infused oils and whole grain mustard. Just north of SF, we had our first hand-shucked oysters, from a dozen we bought in Tamales Bay along with an oyster knife. We wound up eating them all on a rest stop picnic bench. Then there were the chartered bus trips into wine country where we were fed and treated like culinary royalty by winemakers who were betting that many of us one day would be. It was a time of pure romance. And it was with this in mind that I made this week’s ice cream. My wife had a box full of figs. We also had a few ripe bananas. I decided to put the two together. When the ice cream first came out of the ice cream maker, it was wedded bliss—a perfect balance of the two fruits. Sadly, when we took it out of the ice box a few days later, the fruit were no longer on such good terms—as if the honeymoon was over. That’s the way it goes with couples. The passionate intensity of the beginning just doesn’t last. In many cases, the relationship doesn’t either. The two people may stay together and put a fig leaf over what is essentially a joyless union but they’re not fooling anyone. Others break apart entirely. Still others keep their bond alive not with fig leaves but with whole figs, and ice cream and maybe a nice bottle of wine. It’s the food of love. Maybe not the only one. But who says there has to be just one. Enjoy it all at once. 1. Blend milk with sugar, flour and salt, and heat to 180-190ºF stirring frequently until thick, cover for 10 minutes. 2. Beat eggs and add ½ cup of mixture while beating, then add eggs to mixture. HEALTH NOTE: Since you’re dealing with eggs here, you need to take care when cooking the custard. Too much cooking and the custard gets lumpy, too little and you risk salmonella. Another alternative is to use pasteurized eggs. 3. Heat the mixture for one minute over medium, then cool with plastic wrap or wax paper pressed onto the top of the mixture to keep it from developing a skin. Cool for several hours or overnight. 4. Add the cream, bananas and figs to the cooled custard mix and puree with an immersion blender, then freeze. 5. Put the frozen ice cream in the freezer for a couple of hours to give it a chance to firm up. NOTE: When freezing ice cream, you need to use an ice cream freezer to ensure that a certain amount of air is mixed into the frozen cream. This gives it a lighter, less icy consistency. When freezing sorbet, you may also freeze it in a popsicle mold, a bowl or on a sheet pan. Be sure to stir the mixture occasionally to limit the size of the ice particles. Larger chunks of ice make for granita, miniscule chunks make for a nice smooth sorbet (an ice cream freezer is ideal). Photo Credit: “The Honeymoon’s Over, Original Version,” from the Sistine Chapel and an errant pair of fig leaves. There is still a lot I need to learn about ice cream and what happens to its flavor after it leaves the machine. Some hold together. Some get better. Some do not. I’ll keep learning whatever I can. But if there are any insights you have to share, please, let me know in a comment.